A root canal is usually our last option to repair teeth that are too damaged to treat using conventional methods (such as with a filling or crown). Instead of removing the tooth altogether, we can repair what’s left of it to extend the overall lifetime of your smile. After all, there’s nothing quite like having a natural set of teeth! After numbing your tooth, a small opening is made in the top of its crown. Next, we remove the nerve tissues inside of the tooth, then clean and medicate the hollow canal inside. Finally, a filling material is placed down into the chamber so that it is sealed off and new bacteria don’t invade the tooth. Afterward, it’s important to place a crown over your treated tooth. This prevents the non-vital structure from wearing down or breaking away during everyday use. 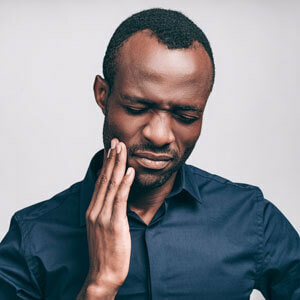 In some cases, severe infection may cause swelling that needs to be controlled with an antibiotic in the days leading up to your root canal. At Praxis Dental, understand that some individuals feel anxious or experience dental phobia when coming in for a procedure such as a root canal. That’s why we take careful steps during your treatment to help you feel as comfortable as possible. In addition to using effective anaesthetics, sedation is available upon request. Ready to find out more? Contact us today to schedule an exam and X-ray. We’re open on Saturdays!